I have read the words of the famous Cuban painter Pedro Pablo Oliva, 2006 National Prize of Plastic Arts, published on his website following his demotion from the post he occupied as a delegate of the Provincial Assembly of Popular Power in Pinar del Río which, once again, demonstrates the perverse nature of the system. Here is a government official — who allegedly represents the people who (also allegedly) elected him to do so, but was deposed by the delegates of the power elite — trapped in the sordid corners of the policies of a country, where, inexplicably, a parliamentarian is not designed, even remotely, to voice political views, much less to voice questions that criticize the national situation. Because of those ironic life’s coincidences, Oliva has the fruit of the tree of peace as his last name but the system has declared war on him. That is why they have officially labeled him with nicknames such as counterrevolutionary, traitor to the Motherland and annexationist as befitting all those who “have moved onto the dissidence dividing lines”, according to a dictum formulated by the “ethics commission” destined to seal the cease of the functions of this parliamentarian. About the Pedro Pablo Oliva case there might be much or perhaps nothing to say. The painter himself states that the purge did not take him by surprise, from what may be inferred that he was aware of the price for his audacity. Already various informational agencies and various websites have offered details about the news. There are those who have given their verdict as well, stoning Oliva from the most inflexible positions of the very “dissident gang”: guilty. Though these accusations are exactly the opposite of what the revolutionary diehards accuse him of, duplicating the same disqualification methods. The charges? 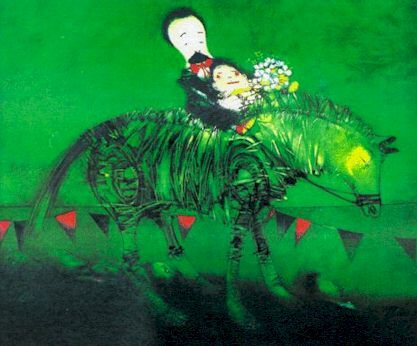 Having been an official representative of the government, having partaken of the ideas of the revolution, having painted Fidel Castro, having confessed to (through persuasion) “sympathy” for him, and being grateful to that same defunct revolution for having become an artist. This isn’t anything that several of his relentless inquisitors have not done at some point. If there is something plentiful among Cubans it’s the propensity to being district attorneys, judges and executioners of ourselves, forgetting that, if viewed through a calm and rational eye, Oliva not only has the sovereign right to commune with whatever ideas he has chosen –the privilege of many, including his second-hand critics- but, as far as I know, he has lent true cultural services to his community, from his potential, a lot more than what most of the celebrities in this Island are willing to do, or what those censors have ever done. That is why I have chosen to be on the side of the testimony of the heretic of the day himself in order to conjure the fairest opinions possible, leaving out all the tribunals of the Inquisition. The analysis of Oliva’s critics, stemming from his own words, is the most enlightening. That is, what he writes in a letter that was published in Yoani Sanchez’s blog, in the answers he gave Little Comrade Edmundo García for this show “La Noche se Mueve” – the Miami version of the Round Table, only more colloquial, sweeter, and with a deceptive sensitive touch — as well as in the letter that the painter has just published in his website. Apart from the likes or dislikes that everyone may feel towards Oliva and from their views or positions (let’s remember that this is really not a politician, but an artist who once thought fit to assume responsibility as a public official in one of the provinces of the Castros’ Cuba), the fact is that everyone has the right to amend his course. Let’s say that the former Delegate to the Provincial Assembly has decided to return to his brushes and resume, full-time, his vocation after being punished for making statements that fall within the broad range of malcontent. That is, in Cuba everything that challenges the official line to any extent qualifies as criticism of a dissident nature. And, up to a point, it is, though, in our view, Pedro Oliva might not be – or he might not have realized it himself — an activist dissident. It is not necessary to always label people or to form the two monolithic sides, so similar to each other: dissidents / not dissidents or revolutionaries/counter-revolutionaries; who may be “good” or “bad”, depending on how they relate to the ideas of the labeler. As far as I’m concerned, if Oliva — with all his prestige as an artist and as a person — makes public statements that many of us agree with, labeled or not, it’s OK with me. We are not talking about two high nominees like Lage and Pérez Roque, who, after Oliva’s downfall signed respective mea culpa little letters exonerating the regime of all liability and burying themselves in their own crap and the crap of their superiors. Oliva is something completely different, and, so far, has not retracted anything he said, neither what we like nor what we haven’t shared. That is honesty and courage. If, in addition, as is the case, the painter made his remarks while he held an official position, I think that is a testimony to the state of putrefaction of the system. And if it doesn’t stink even worse, it is because the coffin’s hinges have not completely popped. Oliva’s judgments are, therefore, welcome. May he paint much, because his art exalts him and us. I, an acknowledged dissident, dream of a Cuba where no one has to keep silent or hide to state what he is thinking. Not even communists. At any rate, Pedro Pablo Oliva’s saga once again places on the front burner the subject of the government’s inability – in all its instances — to head a process of change within Cuba. The real loser in this process is the regime. For the rest, if the elected officials themselves cannot state their points of view and are punished for disobeying the norms (“code of ethics” is what they call the mysterious ritual of swearing in that deprives representatives of their right of speech; in theory, of the people’s will) what’s left to mere mortals, without a voice and with a false vote! The proposition to change a system without changing ideas is absolutely impossible, and neither is the intention of a vote to overcome the inertia without breaking, de facto, the rigidity of the Stalinist schemes rooted in the ruling ideology. Wish there were more “Olivas” among the artists, intellectuals, and officials of this Island. In the meantime, we will continue to wait for a statement of the UNEAC or the Ministry of Culture … or at least a small Granma notation informing its people about the “deviations” of this illustrious derailed comrade. To your health, Pedro Pablo Oliva, and may honesty and the muses of your art continue to guard you! Some obviously well intentioned readers have sent me valuable suggestions regarding the events that have been occurring in the city of Santa Clara, in the Villa Clara province. These readers ask me to use images that attest to the events cited, but they overestimate this blogger’s materials and logistics. Regretfully, I inform you that if I had those images in my possession, I would have made them public. I want to return to the issue because the quasi-clandestine nature of citizen journalism in Cuba is often misunderstood, even by openly dissident bloggers, as is this friend of yours, with the impossibility of being in all scenarios and graphically recording the events that take place. In this continuing saga of repression against individuals and groups who criticize the government, one of the first measures adopted by repressors is precisely to prevent the taking of photographs or videos, a relatively efficient way of conveniently denying the events. The recent death of John Wilfredo Soto after a brutal police beating in full view at Parque Vidal, loudly denied by the government, could not be recorded, at least not by any citizen who was present, as far as we know today. If pictures do exist, they would be collected by their own security cameras, which, according to friends of this beloved city, are installed at the Hotel and the CADECA, both in front of said park. If the authorities were willing to dispel doubts of the national and international public opinion, by publishing images of Soto’s courteous arrest by the police, the “lying mercenaries” would be ridiculed. However, the fact that there are no pictures does not mean that the events are not taking place. Unfortunately, there are many examples in history showing “truths in retrospect” shocking photographs and films about something that had been completely ignored, as the existence of the sinister work fields, or the Nazi death chambers, or the atrocities of the Soviets against the Polish people. For example, fairly recently, the world found out about the Katyn events, and though the Internet era certainly facilitates the mobility of the news and allows users to report events in real time, let’s not to forget the conditions in Cuba, where connectivity is minimal and there are only a few who have the ability to occasionally tweet from cell phones. That’s why our own meager networks are based on a system of solidarity-credibility-confidence. I reported the information that a colleague and friend Carlos Valhuerdi offered me from Santa Clara, and I quote him at every instance. It’s a way to support and protect the most vulnerable: the dissidents in Cuba’s provinces, more exposed than those who live in the capital. To disclose what our friends tell us is a way to offer our faces and run the same fate. It means not being alone, though often we don’t share the same political ideologies, which is not what unites us, but the civic spirit of aspirations for a democratic future for all Cubans. My credibility is certainly the only asset I have, so I can’t afford to put it at risk. I place my trust in friends in Cuba’s interior, as in the case of Luis Felipe Rojas, from the distant San Germán; Ferrer, from Santiago de Cuba or Granma; Dagoberto Valdés and the group Coexistence, in the charming Pinar del Río region; Santa Clara friends or many others. They are all valuable and truthful testimony enough for me. Each is responsible for what they provide, and there are a few of them who suffer persecution, beatings, meetings and even arrests and jail because of it. I understand that my Santa Clara colleagues have been compiling information, interviews, recordings of testimonies, etc., which will sufficiently support what is reported in this blog and other sites. I will appreciate for those who trust in us and know about the Cuban situation to make the events public and, when appropriate, claim responsibility for their sources. I will count on you. Protests in Spain. Internet photo. During this past week, the official Cuban media have shown very reliable evidence of how it is possible to use information from international events to mask and to try to dilute conflicts within the Island. There is no doubt that government journalism takes the cake in what I normally call the squid effect: a dark stream of dark ink for slipping away in the midst of the confusion and coming away unscathed. At the same time, it tries to create the false expectation that a reversion to communism in Europe is close at hand and viable. In Spain, no less. The latest news acquisition by the media to squirt its ink on the national disinformation spectrum has been the demonstrations that have been taking place in several Spanish cities, and the press has instantly launched into its fabrication of an environment supposedly conducive to communism in these expressions of social discontent. 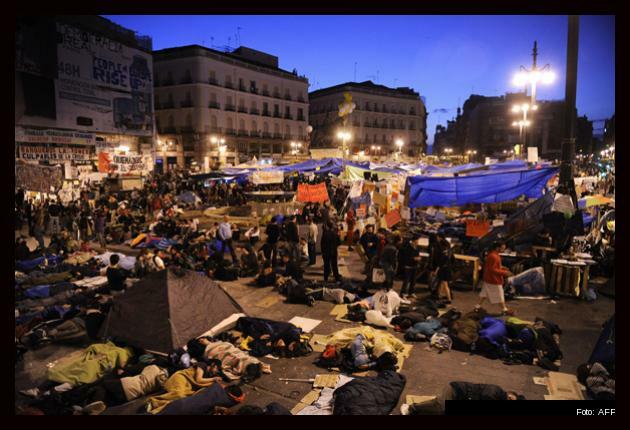 Judging by what the written press and TV newscasts are publishing, the popular clamor in Spain is inspired by a spirit between Marxist and anarchist, capable of bringing down Capitalism, Transfiguring the social order and establishing the first labor commune of the XXI century. As simple as that. Of course, it doesn’t show it explicitly, but those are the intentions underlying the reports. A simple example is the “declarations” of one of the protesters expressly interviewed by the newspaper Juventud Rebelde…via e-mail. Could it be that this subject was carrying a sign with his e-mail address, to make things easy to the journalists on this side? Coincidentally, the individual is a Communist sympathizer or militant. The journalists in our national press have such good aim! 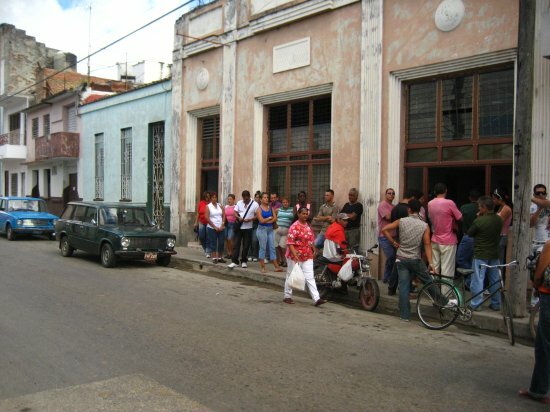 Thus, the mobilization of Spanish citizens, mostly young, under the legitimate claims of changes capable of reversing the current economic crisis, unemployment, corruption and other ills afflicting the Iberian country, have been converted, by the grace of the official Cuban press, into a revolution ready to destroy Capitalism and establish a system change. It is no coincidence, then, that the unusual role is being granted to the United Left from the official media, as if it were the party that organized, convened, and sustained the protests in the plazas, and counted on an overwhelming social support. And, in addition, it is an occasion to celebrate! From the logic of journalism at the service of power, movements against Ahmadinejad in Iran, or against Muammar Gaddafi in Libya don’t qualify as real, national, people’s demands, but they are uprisings organized from outside by the West, though the peaceful protests that take place in the heart of a Western democratic society constitute practically a prelude to a legitimate and vindicating Marxist labor revolution by the will of the majority of Spaniards. Without a doubt, a minority party would do everything possible to seize the day’s critical moment to try to grab a larger share in the current political scene. It is exactly what this United Left seems to be doing. It is clear that many Spaniards are fed up with the crisis and are making use of the advantage of living in a democracy; that is, they are exercising their right to protest, to demonstrate publicly, and to claim what they consider just. That is infinitely more than we Cubans can dream about right now, sunk in the manure of Tropical Communism, so I hope that Spaniards know enough to safeguard those civic spaces they enjoy. I hope that the protesters in the Spanish Squares are able to achieve their goals without waiving their right to demand them whenever they see fit to do so. I hope that the vicissitudes of their long and rich history will allow them to discriminate between the word “change” and its main antonym “communist system”. I have great faith that the country that knew how to develop a remarkable transition after the tensions of a long dictatorship will be able to respect the constitutional order and achieve its aspirations without turning violent its civility, a pillar of liberty that cannot be surrendered. May their crisis be about growth and not regression. These are my best wishes for Spain, from the depths of my communist hell. At the close: Monday May 23, the results of the regional and autonomic elections were published, and the Partido Popular won. The Cuban media, curiously, have refrained from mentioning where the United Left came in. Since the death of John Wilfredo Soto this past May 8th as a result of beatings received by local police, successive acts of violence, threats and harassment of various kinds have been carried out against dissident groups and individuals in the city of Santa Clara. My friend and colleague, Carlos Valhuerdi, has informed me by telephone about the hospitalization of Jorge Luis Artiles Montiel (Bebo) on a hunger strike since May 9th to demand justice for Soto. Bebo was admitted to the medical room C, bed 21 (phone (42) 270 450) at the Arnaldo Milián Hospital in the city of Santa Clara. Witnesses who had contact or were involved in the care of Soto shortly before his death continue to be harassed. Such is José Lino López Asencio’s case, who was beaten earlier last week by some individuals while they shouted revolutionary slogans in an isolated neighborhood near his home. Lino went to the hospital with severe headaches, dizziness and vomiting, where he was treated by a Bolivian student because the doctor had “no time” or “was busy.” The student ordered a head x-ray, which came back negative: Lino showed no fractures. However, they did not order a tomography and much less an MRI or any other additional tests, except an abdominal ultrasound to verify that pancreatic fluid had not leaked into the cavity. Apparently, the medical authorities at the Santa Clara Provincial Hospital have discovered that dissidents in the region have the tendency to develop rare pancreatic disorders. Finally, at this “consultation” Lino was advised complete rest and prescribed Naproxen to treat inflammation. Later that night, he again returned to the hospital and received an analgesic injection intravenously to relieve the headache. The friend who accompanied him, Sander Reyes Machado, said that, after leaving Lino back at his house and setting out for home, some unknown individuals were waiting for him in that same remote neighborhood, who attempted to beat him with clubs, but ran away because Sander was armed with a machete and showed his intentions to use it to defend himself. Lino continued with headaches, dizziness and swelling of the face into the next day. Once again he went to the hospital. This time they indicated a tomography and reached a diagnosis of a left sub occipital neuralgia with post traumatic cephalalgia. The neurosurgeon who examined him, Dr. Agustín Arocha García, stated there were no blood clots in Lino’s brain. They continued with the anti-inflammatory treatment. As if all the troublesome process were not enough, on Saturday, May 21st, Lino was taken to the Third Unit of the Santa Clara Police, so that he could once again relate the assault he was subjected to. Just five days after his initial declaration, Lt. Colonel José Luis Pacheco Ribalta, Head of Province Criminology — who had previously been a police-instructor — conducted an interrogation peppered with threats, and belatedly took photographs, when the Naproxen tablets were already having their effect on the facial swelling. They indicated that they would “investigate” the events and that “they would question him again”. Carlos Valhuerdi, dissident and independent journalist in Santa Clara is the source of any information expressed herein. As Valhuerdi states, harassment of members of the group linked to William (Coco) Fariñas has gone on since Soto’s death, and there is strong pressure against witnesses of police brutality. A group representing Guillermo Fariñas’s group stood outside the Third Unit, in Lino’s support, while he was being interrogated. I recently wrote an article published in this Journal, which, to my satisfaction, has provoked several controversial comments. I say this is satisfactory, because several decades of absence of public debate in Cuban society, has contributed greatly to the lack of solutions to problems that have multiplied to create a general stagnation. Thus, any outbreak of discussions about events and proposals on the current reality of the island can only encourage a climate of change or at least spread the idea of its necessity. It is for this reason that I return to the same subject, more with the intention of addressing the emergence of a phenomenon that–whether some readers like it or not–is happening, and which must be considered if we want to objectively analyze the social present in Cuba and not incur the pattern of exclusions and subdivisions (revolutionaries/counterrevolutionaries, patriots/traitors, Cubans/anti-Cubans, etc.) that have been so useful to the government. All process of change is preceded by certain manifestations of thought, apparently isolated, the majority of them spontaneous, that have the virtue of unleashing events not always directly derived from the initial action, but equally related to the social environment shared by diverse groups and sectors with specific interests. So, for example, the beginning of the alternative blogosphere–taking as the date the birth of the blog “Generation Y” on the Desde Cuba website and with relative rapidity extended within the Island–could be related to a phenomenon that preceded it, the Intellectual Debate, although the former is not exactly a consequence of the latter. The truth is that both events, the Debate and the blogosphere, are part of a social environment in common, a few months after the Proclamation that “provisionally” passed power from one Castro to another, when a strong expectation of change emerged and dominated general sentiment, a mix of hope and uncertainty. While the first phenomenon had an ephemeral character, the second has been extended and strengthened in the last four years: the Debate, however–that came to public attention as “The Email Skirmish”–was the first visible manifestation of a wave of virtual debated that far exceeded the initial topic of discussion (the presence on national television of certain sinister censors of the culture), to the point of seriously questioning the cultural politics of the Revolution and other deeply-rooted aspects of the Cuban reality. Obviously, in February 2007 the authorities could not silence by way of a meeting–with entrance by invitation-only and behind closed doors at the Casa de las Americas, under the supervision of the Minister of Culture–the expression of the growing dissatisfaction of many intellectuals, writers, artists and other sectors of society. Since that time, independent of the incident that provoked the beginning of the debates and the “official closure” given to the process, nothing was the same: they had opened a Pandora’s box of public opinion, although, in the absence of other possible scenarios, the debates had taken place on the virtual web. barely two months after the smothering of the Debate, the alternative blogosphere began. A quick look evidences several basic elements of this phenomenon: its essential spontaneous and independent character; the variety of its composition, be it in the themes of the blogs, in the generational differences among the bloggers, and the individual interests and styles; the rapidity of its growth and its ability to multiply, maintain itself and evolve qualitatively despite the proverbial limitations of connecting to the Internet in Cuba and the harassment by the authorities. It is a heterogeneous and peculiar phenomenon, differentiated from any previous civic manifestations, but not divorced from them. Meanwhile, in recent years, other virtual spaces have began to emerge, which may not be as independent or spontaneous, but which are also opinion sites. Perhaps, in turn, these spaces wouldn’t have been possible without the antecedent of the alternative blogosphere; in any event, some of their creators have been expressly designated by the ideologues of the system to confront the limited, but quietly growing influence of some of these alternative blogs. 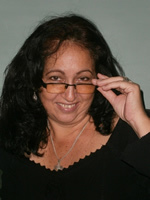 That the authorities have been forced to allow official or pseudo-official opinion spaces is quite an achievement, whether their pretensions are to weaken the development of civil society within Cuba, to impede the free flow of information and debates, or simply to confuse permeable and indecisive sectors. It’s because of this that, even if they have reservations about the appearance of “revolutionary dissidents” on the virtual Cuban spectrum, that don’t consider it prudent to slam the door on such offers. It wouldn’t be healthy to call for dialog and at the same time yield to mistrust. It is clear that there will always be opportunists and camouflaged agents, but those are the ones we should be capable of identifying. We don’t fall into the temptation of repeating the pattern that we reject. These and other new spaces could offer the possibility of building bridges and fomenting civic discussions among Cubans of different trends of thought. Although to many of us it may sound like heresy, it is likely that among the new “revolutionary” critics are not only the usual dogmatic characters, now disguised as reformists, but also young thinkers who could well contribute to a national dialog and a transition based on respect for differences and the inclusion of all social groups of the most diverse interests. My proposal is, then, to accept the challenge: to launch our ideas and aspirations; to engage in an inclusive, transparent and open debate; to make visible our differences and to offer arguments against slogans. After half a century of sterile barricades, we have nothing to lose and much to gain. During this past week, Mr. Carlos Valhuerdi, an independent journalist at the Cubanacán Press website, has been telling me about some recent developments beginning on the night of May 7th through the 8th in the city of Santa Clara, after the death of John Wilfredo Soto, resulting from a brutal beating at the hands of four uniformed police officers and which, with unusual haste, was denied by government authorities in a press release issued on Monday the 9th. On May 12th, Granma published an additional whole page article (page 3) titled: “Cuba Scorns Lies” with some eyewitness accounts – among them one of an inexplicably smiling sister of the recently deceased Soto — as “evidence” of the falseness of the beating. There are always people lacking in scruples ready to surrender to fear, whether they are relatives of the victims of repression or not. What Granma has not reported is the death, on the night of May 11th, of one of the policemen involved in the beating, as a result of a gunshot to the head by his own hand on the same Sunday afternoon, the 8th. According to testimony not published by Granma and revealed to me by phone by my colleague Valhuerdi, the policeman’s name was Alexei Herrero, and he shot himself in the bathroom of his home, located on the outskirts of Santa Clara known as Callejón de San Antonio, on Camajuaní Road, after having returned from the second meeting he had been summoned to by investigators into the death of Soto. The wake for Alexei — an individual with propensity for violence, according to testimonies — was held under heavy police presence at the Santa Clara Funeral Home (formerly Camacho Funeral Home), an action that extended to the deceased’s own home. Tension has prevailed in the capital city of Villa Clara, with a steady eye on the opposition, threats, and even retaliation. Héctor Bermúdez, a member of the group led by William (Coco) Fariñas, was stoned after making public statements about the police operation that broke out in the provincial hospital Arnaldo Milián and the pressure that was put on doctors when Juan Wilfredo Soto was admitted, which he witnessed personally. Bermúdez suffered a head wound, as he headed back home, that required stitches. On Friday the 13th Santa Clara was still not peaceful. Valhuerdi again told me about an incident that day at Parque Vidal, in the heart of the city. This time, a group of citizens — not organized members of an opposition group — orchestrated a spontaneous repudiation rally against Amado Gómez Rodríguez, , a flower seller around said park and one of the witnesses presented by the newspaper Granma, who had stated that Soto did not receive a beating as the “enemies of the revolution were describing”. The group in question was accusing Amado of being “a snitch” and other epithets along those lines at the top of their voices, until uniformed policeman peacefully broke up the angry Santaclareños without hitting, fining, or arresting anyone. Lesson learned, or wisdom of the moment, the truth is that this is not the best time to do something like this in Cubanacán. In closing, this Sunday the 15th, Our Lady of Charity came to Santa Clara, following the pilgrimage route through Cuba to mark the 400th anniversary of her appearance, to be held in 2012. 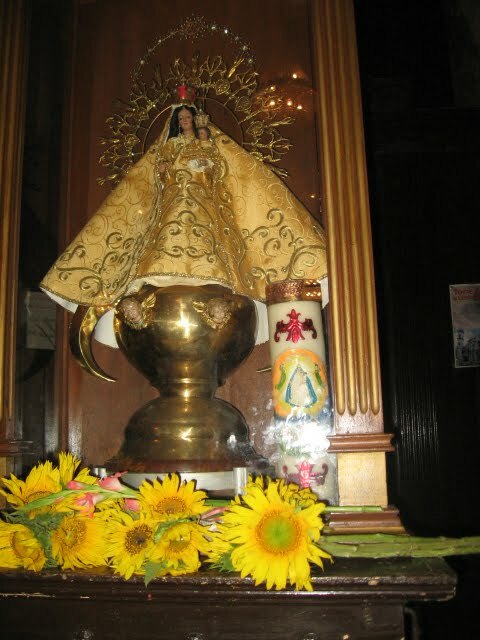 It is said that the Cuban Holy Patron’s reception in Santa Clara was exceptionally outstanding, with a massive congregation of believers and nonbelievers who attended under the force of her symbolic significance in the popular fancy: it is, so to speak, the Cuban Holy Virgin of Freedom since her presence in the fields of the Independence peasant fighters. Cubans, after half a century of broken illusions, are seeking a faith that will unite and sustain them. Despite the grief that loss of life due to violence incited from power signifies, it is appropriate that the authorities have received, loud and clear, an unequivocal signal: sooner or later, people get fed up with their oppressors. Legitimization of violence, as unwritten guidelines of the VI Congress, could backfire against the dictatorship one of these days. Let’s not forget that clever saying: For they have sown the wind, and they shall reap the whirlwind. After the close of the Sixth Congress of the Communist Party, which officially established its approval of the stagnation of the system, and circumvented the changes of large social sectors, including official sectors, the only point on the official agenda that seems to be right on the mark is the repression of the alternative groups that have been growing at a significant pace in recent years. During the month of April and until today, we have witnessed a marked upsurge in acts of harassment, arrests, intimidation, house searches, seizures and threats against members of the dissidence, both opposition party members and representatives of the independent civil society, in an escalating repression that has even caused the death of a citizen, Juan Wilfredo Soto a victim of a brutal beating by the local police last May 8th (Mother’s Day) in the city of Santa Clara. A strategy of reducing protesters while at the same time reinforcing fear in the population is the strategy chosen by the “reformist” General, who aims to establish his cosmetic measures in order to retain the most absolute control over the social actions and thoughts in a country where the tensions and the absence of rights, long violated by the dictatorship, continue to accumulate the ingredients awaiting the suitable breeding ground for an eventual process of protests. The General wants to introduce an artificial peace, though for his zealous subordinates – not exactly characterized by having a high IQ — this might literally be the sepulchral peace. That is why, with cynicism that impunity allows, the official media were, with unusual speed, quick to “clarify” with its “moral fortitude” its own truth: the “murder victim” (whose exact meaning, according to Aristos dictionary, is “killed violently”) was no less than “a delinquent” who “fulfilled his two-year prison sentence”. In short, from the perspective of the regime, Juan Wilfredo deserved to die, although it would be inconsistent to assume that the lynching by kicking an opponent was exactly the General’s intention when he called from his mock revolutionary congress for revolutionaries to defend the streets. Simultaneously, the authorities are also developing a quiet but steady purge job within official places, using extreme measures in the presence of any suspicion, primarily in relation to Internet usage. In this regard, the Telecommunications Company (ETECSA), now completely controlled by the Ministry of the Armed Forces, has gone so far as to fire young computer techs from their jobs because of the absurdly punishable circumstances of having occasionally connected to Facebook, or “of having used the Internet excessively”, or under the pretext that those responsible for computer security “have lost track” of sites they connected to, which shows that the social networks and the access to information currently constitute true threats to the regime. Careful monitoring of its employees, forced to convincingly justify every minute of virtual navigation, collaterally contribute to the establishment of a state of permanent fear in those individuals known to be monitored. Paradoxically, such a system only manages to breed a sense of rejection of the government, because young people subject to such controls can thus more clearly perceive the castration of their freedoms. In short, if the physical and psychological repression is the strategic card chosen by the regime, little would be left for it to do. It is the most effective method it could have found to help, sooner rather than later, to fill the dissent ranks.